Letters in Sanskrit are believed to be loaded with mystic power that are yielded when pronounced correctly. Vowels can be classified further as simple and diphthong vowels. A simple vowels is also called a monophthong. The vowel has the same sound at the beginning and end. Simple vowels can be long or short. The difference is in the length of duration of pronunciation. Long vowels are pronounced twice as long as the short vowels. A diphthong is formed by the combination of two vowels in a single syllable, in which the sound begins as one vowel and glides smoothly towards the second. In Sanskrit all diphthongs are long vowels. Lastly there are the Anusvāra and the Visarga. Anusvāra is a nasal sound whose pronunciation varies based upon where it appears in the word. Visarga literally means sending forth. It is pronounced as if the air is expelled from the lungs. However, it's pronunciation varies based upon the preceding vowel. Consonants are pronounced by stopping the air flow at the appropriate place. They can be pronounced only with the help of the vowels. So, traditionally when the alphabet is chanted, the consonants are combined with the vowel अ.
Consonants are grouped into mutes, semi-vowels and sibilants. These consonants are pronounced by the complete closure of the various mouth organs. In fact, they are further categorized into several groups based on the mouth organ used for pronunciation. These letters are pronounced with the help of the throat. These letters are pronounced with the help of the jaw. These letters are pronounced with the tounge hitting the roof of the mouth. These letters are pronounced with the help of the teeth. These letters are pronounced with the help of the lips (the two lips should meet each other). Furthermore, the first two letters in each group are the hard consonants (also called as surds or toneless - अघोष) and the next three are soft consonants (also called as sonants or toneful - घोषवत्). The last letter in each group is also a nasal (अनुनासिका) i.e. the letter is pronounced with the help of the nose. The first letter, third letter and the nasal letter of each group are pronounced with a small breath or aspiration. They are referred to as unaspirates or consants with small expiration (अल्पप्राण). The second and fourth letters of each group are pronounced with a great breath or aspiration. They are referred to as aspirates or consonants with a great expiration (महाप्राण). Like the vowels, these letters are pronounced by the smooth flow of air. However, like the consonants the sounds are made by stopping the air flow at the beginning of pronunciation. Hence, they are called "semi-vowels". 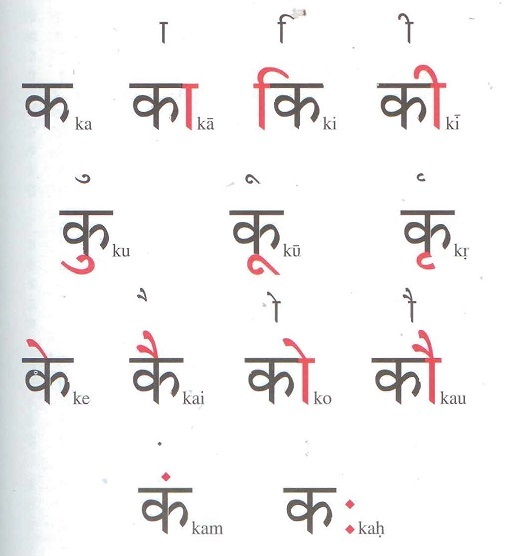 The semi-vowels have a special significance in Sanskrit. The Bija (seed) mantras are formed by these letters. Several Yoga breathing exercises use these letters as well. In Sanskrit, when vowels combine with consonants, the vowels are represented by special symbols. Vowels are generally represented by the same symbol irrespective of the consonant they combine with. A combination of a consonant and a vowel yields a single syllable. Every syllable has one or two mātras (मात्र). Mātra is a unit of length in pronunciation. In other words, the length of a syllable is measured by a mātra. Short vowels and consonant combinations with short vowels have one mātra. Long vowels and consonant combinations with long vowels have two mātras. If the first consonant ends in a vertical line then remove the vertical line and the second consonant. Use a stop sign and add on the second. Truncate the first letter and write the second. Write the second letter under the first. If र is the first character then it goes as a "c" above the second character. If र is the second character then it goes as a "forward slash" or an "upside down v" below the first character. Every nasal combines with a member of its own group. Sometimes consonants blend to become special conjunct characters.